Pittcon, a premier annual conference devoted to laboratory science and instrumentation, takes place from March 2 through March 6, 2014, at McCormick Place in Chicago, IL. Micromeritics will be located in two locations at this year’s conference. Micromeritics and its Particulate Systems brand will be displaying a variety of instruments including our new 3Flex Surface Characterization Analyzer and NanoPlus Nano Particle Size and Zeta Potential Analyzer in booth 2213. Micromeritics Analytical Services (MAS) and Micromeritics Pharmaceutical Services (MPS) will showcase their wide range of contract materials characterization services in booth 2750. Micromeritics 3Flex™ Surface Characterization Analyzer is a fully automated, three-station instrument capable of high-performance physisorption, mesopore, micropore, and chemisorption analyses with superior accuracy, resolution, and data reduction. Each analysis station is upgradeable from mesopore to micropore with the option of designating one station for chemisorption analyses. All analysis stations can be configured for krypton analysis of low surface area materials. Vapor sorption capability is standard. A single 3Flex with its minimal footprint and three configurable analysis stations eliminates costly investment in multiple instruments and additional bench space. The 3Flex is ideally suited for the characterization of MOFs, zeolites, activated carbons, adsorbents, and a wide variety of porous and non-porous materials. With the chemisorption option, the 3Flex can be configured to perform chemical adsorption analyses that enable the researcher to obtain valuable information about the active properties of catalysts, catalyst support, and a variety of other materials. The 3Flex includes Micromeritics’ intuitive MicroActive™ for 3Flex software which gives the user the ability to interactively evaluate isotherm data and reduces the time required to obtain surface area and porosity results. The new TriStar® II Plus Surface Area and Porosity System is a fully automated, three-port gas adsorption analyzer intended for laboratories that require the combination of expanded throughput and the highest quality data. Suited for use in both quality control and research environments, the analysis ports operate simultaneously and independently of one another. Capable of collecting up to 1000 data points, fine details of the isotherm can be observed and recorded providing high resolution and revealing pore structure details. The new ASAP® 2460 Surface Area and Porosimetry Analyzer incorporates a unique expandable system designed for upgradeable high-performance and high sample throughput. This versatile surface characterization instrument can be configured as a two-, four-, or six-station bench top system depending on the user’s throughput needs. The base ASAP 2460 is a two-port master control unit. For additional throughput, two-port auxiliary units can be connected to the master unit expanding the system to either a four-port or six-port analyzer. The instrument also includes enhanced software capabilities, data reduction features, and instrument monitoring. Micromeritics is also showcasing the Saturn DigiSizer® II High-Definition Digital Particle Size Analyzer, a highly-advanced tool for those faced with challenging particle size distributions. If process variability is affecting the desired yield, performance, or quality of your product, take control of your process with the Saturn DigiSizer. Superior resolution allows the user to characterize outlier particles not visible to other particle sizing systems. With unique design and data reduction features, this instrument measures particle size in a range of 40 nanometers to 2.5 millimeters with an extremely high level of resolution, repeatability, and sensitivity from unit to unit and site to site. Micromertics AccuPyc® II 1340 Gas Displacement Pycnometry System is a fast, fully automatic analysis system that provides high-speed, high-precision volume measurements and density calculations. The AccuPyc determines absolute density of powders, solids, and slurries having volumes from 0.01 to 2000 cm3 with superior accuracy. For those who require high throughput, an integrated control and analysis module can operate up to five additional external analysis modules. Temperature control and custom-sized modules can be configured to suit unique applications providing even more versatility. Particulate Systems offers instruments that are complementary to Micromeritics’ core product line. Materials characterization analyses include: nano particle size, zeta potential, particle shape, high-pressure adsorption isotherms, dynamic vapor sorption, activity and selectivity of catalysts, surface energy, segregation testing, powder strength, and determination of low levels of iron content in a variety of materials. The new NanoPlus™ Nano Particle Size and Zeta Potential Analyzer utilizes photon correlation spectroscopy and electrophoretic light scattering techniques. Compact and easy to use with an extended analysis range, intuitive software, and multiple sample cells to fit the user’s application, the instrument can measure particle size in the range of 0.1 nm to 12.30 μm with sample suspension concentrations from 0.00001% to 40% and zeta potential of sample suspensions in the -500 mV to +500 mV range with concentrations from 0.001% to 40%. The NanoPlus is available in three model configurations: the NanoPlus-1 – nano particle sizing instrument; NanoPlus-2 – zeta potential instrument; and NanoPlus-3 – combination nano particle sizing and zeta potential instrument. Particle Insight™ Dynamic Image Analyzer is ideal for applications where the shape, not just the diameter, of raw materials is critical to the performance of the final product. The Particle Insight offers up to 28 different shape parameters analyzed in real-time in either aqueous or organic solvent suspensions. The system measures particles in a range from 3 µm up to 300 µm in its standard configuration. The fully automated SSSpinTester Low-Volume, Bulk-Strength Analyzer uses the science of centrifugal force to measure the unconfined yield strength of fine powders requiring a very small amount of sample (0.5 cc). The instrument provides repeatable and consistent data by first consolidating the material using centrifugal force to compress the sample inside the sample holder. After the initial compaction step, the SSSpinTester then completes the analysis routine using the same centrifugal force to determine the yield strength of the material. The SSSpinTester is capable of fast results, collecting a single data point in as little as three minutes and a five-point flow function in as little as 15 minutes. Particulate Systems will also showcase the DVS-Intrinsic. Dynamic vapor sorption, commonly known as DVS, is based on the gravimetric determination of the quantity of vapor adsorbed or desorbed from the sample material. By varying the vapor concentration surrounding a sample and measuring the change in mass it produces, the rate and quantity of solvent adsorbed by a sample can be measured. 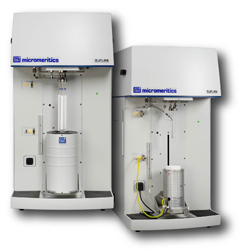 Surface Measurement Systems, represented by Particulate Systems, offers a wide range of Dynamic Vapor Sorption instruments that utilize dynamic gas flow and the gravimetric technique to produce high-resolution adsorption and desorption isotherms of water and organic vapors on solid materials. Humidity can adversely affect a range of materials to include food, pharmaceuticals, fuel cells, packaging, high energy materials, polymers, building materials, filtration materials, and personal care products. Knowing how water vapor interacts with these materials can yield vital information for the proper formulation, processing, and storage of these materials. The DVS-Intrinsic is an entry level, water vapor only instrument. With a small footprint, it operates in the 20 to 40 °C temperature range. Exhibiting in booth 2750, Micromeritics Analytical Services (MAS) and Micromeritics Pharmaceutical Services (MPS) both provide contract sample analyses and consulting services. Featuring products manufactured by Micromeritics, they offer additional services outside Micromeritics current product line. Materials characterization services include: particle size distribution, particle shape, particle count, nano particle size, surface area, micropore analysis, pore volume distribution, total pore volume, density, surface energy, dynamic water vapor sorption, TGA, DSC, active surface area, percent metal dispersion, crystallite size, high-pressure adsorption isotherms, magnetic content, zeta potential, isosteric heat of adsorption, microscopy, method development, method validation, and consulting services. MPS enables Micromeritics to expand its analytical service capabilities and meet the growing demand for contract services from the pharmaceutical industry. MPS utilizes a DEA-licensed, FDA-registered, cGMP/GLP-compliant contract analytical laboratory and provides a comprehensive service program to provide additional services that include API characterization, excipient screening, powder flow properties, batch variability, identification of critical quality attributes, and QbD/PAT implementation.